Here's another wonderful artbook put out by Blizzard Entertainment and publisher Insight Editions. The Art of World of Warcraft is a huge 224-page hardcover. The cover has a smooth almost velvet treatment with glossy prints of the title and cover art. The binding is great. The first thing I want to point out is there is actually another book with the same title that was published in 2005 by BradyGames. I'll not be comparing this book against the previous one because I don't have that book. This new artbook is a collection of illustrations and concept art for the game. The games included are World of Warcraft (2004), The Burning Crusade (2007), Wrath of the Lich King, Cataclysm (2010), Mist of Pandaria (2012) and Warlords of Draenor (2014). So we have six games featured in this 224-page hardcover. I do feel that they could have included more pages, especially so when The Art of Blizzard Entertainment has 376 pages. And there have been game specific artbooks such as The Cinematic Art of World of Warcraft: The Wrath of the Lich King (154 pages) and the one that came in the collector's edition for Mists of Pandaria (208 pages). And because there has been other artbooks that feature WOW art before, some of those artworks are duplicated in this book. It's not a big issue because there are a lot of new artworks included too. What I like about the book is it's huge. The artworks look wonderful printed in high resolution on the huge pages. Some of the artworks spread across two pages. Others take a whole page by themselves. It's satisfying to look at the huge reproduction of detailed coloured illustrations. The colours came out really well. The artworks themselves are beautiful to begin with. The WOW style of art is very recognisable. Most artworks are fully coloured with the occasional sketches. There's a good mixture of character and environment art. The captions are printed in classy gold fonts against black. The commentary are from Bill Petras, Samwise Didier and Chris Robinson and they are interesting to read. However, not all artworks have captions and the last 20 over pages are devoid of any captions. This is a fantastic video game art companion. Highly recommended to all fans of WOW. 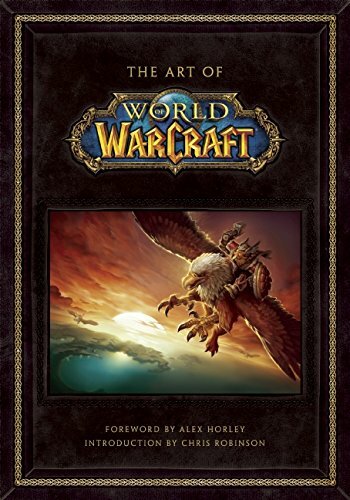 And if you're a WOW fan, you should definitely also check out World of Warcraft Tribute, World of Warcraft: Ultimate Visual Guide and of course The Art of Blizzard Entertainment.